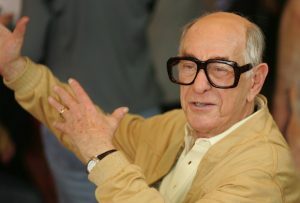 Comedian Shelley Berman died yesterday. I never worked with him but we did spend an afternoon together. Six years ago, I was having my car repaired at MBZ Motors in a dreary corner of the San Fernando Valley. I can’t remember why, but I was stuck there all day while the work was being done. There was no where else to go. I had my laptop with me and I was trying to write. Shelley Berman came in to have his Mercedes repaired and sat on the couch across from me to wait it out. I recognized him immediately (my Dad had his records when I was a kid and I saw him perform once — I believe it was in San Francisco) but I didn’t pay attention to him out of respect for his privacy. And I wanted to get some work done. But it soon became apparent from the way he was talking to people in the waiting area, all of whom were relatively young, that he was very eager to be recognized and was greatly disappointed that nobody knew who he was. They treated him as an irritating old man they wished would just leave them alone (though, I must say, the staff at MBZ was incredibly friendly and respectful to him — they clearly had known him for some time). I felt sorry for him. He was an incredibly talented comedian and actor…and it broke my heart that it appeared to him that he was forgotten. So I spoke up, addressed him by name, told him that I knew who he was, and that I enjoyed his work on BOSTON LEGAL, CURB YOUR ENTHUSIASM, and that my father had his records. He broke into a big smile. Berman then went on to regale me over the next few hours with amusing and emotional anecdotes from his life — even sharing with me the heartbreak over the death of his young son (and tearing up as he told me). It was remarkable experience…and also a bit uncomfortable. There was something not quite right about his need for attention or how open he was with me, a complete stranger, about his life (I remember wishing I’d recorded it all). Now that I’ve read his obit, and learned that he passed away from Alzheimers, the strange encounter makes a bit more sense. But it was a memorable afternoon and I felt honored to have been his audience of one.